Remember my post about some life changes I posted a few weeks back? You know, where I mentioned my new found obsession love of yoga, and talked about my attempt at improving my overall physical and mental health? Well I've now added juicing to the mix and I wanted to share it with you guys. 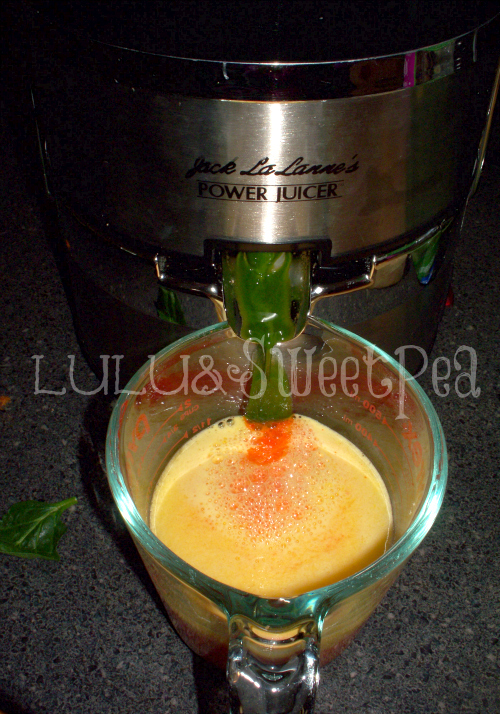 My husband bought this Jack LaLanne Power Juicer on a whim at Costco about 6 years ago (and yes, it's just like the one you see on the infomercials- it actually works great!) We used it a few times and quickly grew tired of the "health kick" we were briefly on and the juicer remained in the box for years after that. I just recently pulled it out of the box, dusted it off, and set it up on the counter right next to my coffee maker in hopes of maybe using it. And you know what? I have been. First, let me start by saying that I'm not a nutritionist or a juicing expert by any means. I couldn't tell you if juicing your fruits and vegetables is just as healthy as eating them, and I've heard people argue on that one. 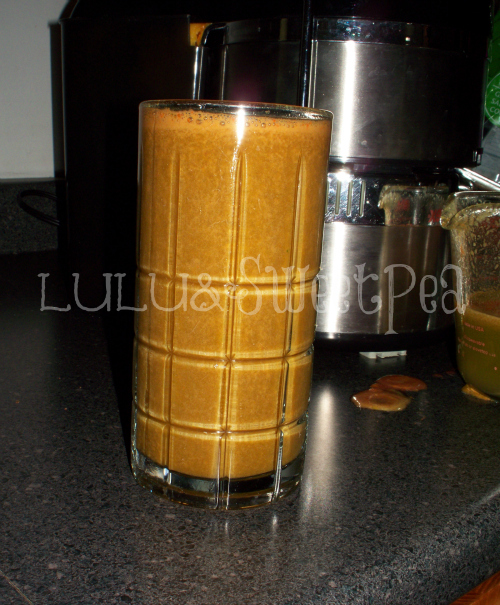 (Read this little bit of info on juicing here). However, I can tell you that juicing is healthier than not eating your fruits and veggies at all, so for me, that's good enough. I figured this was at least a good way for me to get some extra vitamins and nutrients, even if it isn't exactly the same as eating all of the produce whole. 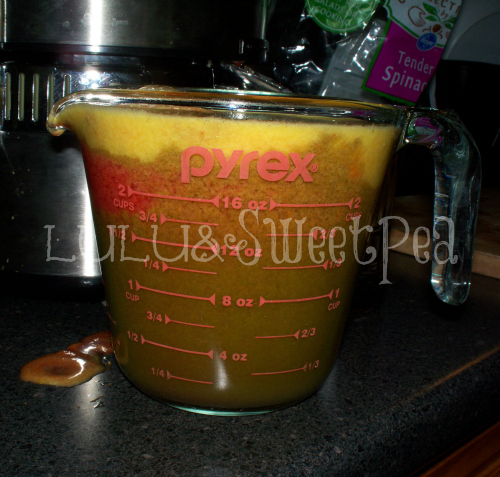 I'm sure some people are cringing at the veggies in the juice, but I promise, you can't even taste them. The carrots maybe a little bit, but they actually have a very sweet flavor. And combined with the apples, oranges, and berries you really can only taste the delicious fruit. Mmmmm. Doesn't this look appetizing? You have to make sure to stir it up really well and drink it immediately. Don't let it sit for too long and don't save it for later because as it oxidizes and sits it will lose some of it's vitamins and nutrients. Plus, this juice isn't pasteurized like the stuff at the store, so it can quickly develop bacteria and become contaminated if you don't drink it right away. This makes more than enough juice for myself, so the kids will actually drink whatever is left over. Yep, my kids love this stuff. They were a little put off by the green color at first, but after they tried a sip they were hooked. My daughter pouts now if I'm making juice and there isn't any left over for her! Have you ever juiced? Or wanted to try it? I'd love to hear your experiences and recipes! I have never, but would love to try! Thanks for sharing the recipe! Pinning and sharing :) GO YOU! I've never juiced before, but I would love to try it. That recipe sounds good. I love carrot juice! We juice all the time! 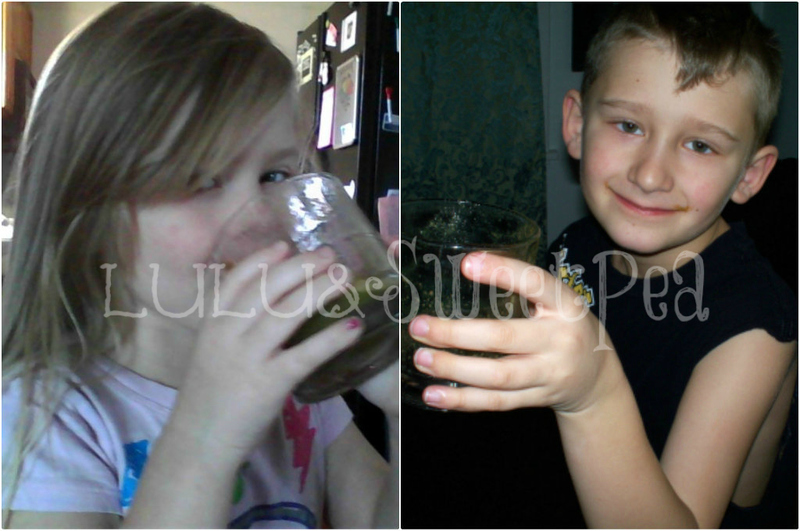 We try to do 1-2 juice-only days per week, as well as a 4-7 day fast each month. You feel like a million bucks! The best advice I've gotten is to "juice the rainbow". Basically, if you juice once in a while, you should try to incorporate fruit and veg from each color group (ex. red apple, orange carrot, green kale, blueberries, white fennel, etc). If you juice for days on end like we do, you can get away with one-color juices. Also, if you're worried that you won't like a flavor, just throw in a 1 inch chunk of ginger. It covers up almost all other flavors! 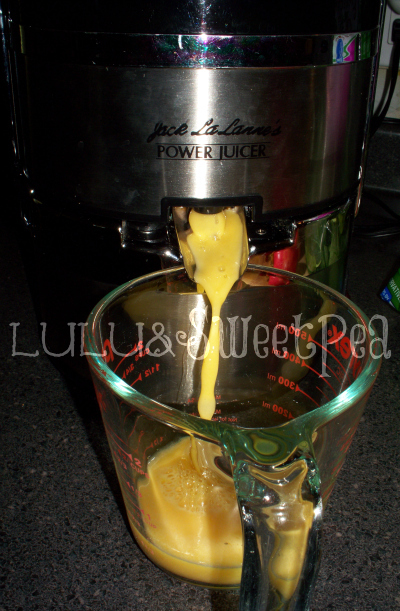 My Jack La Lane juicer motor exploded and it flew in a million pieces all over my kitchen. I had carrot juice all over the kitchen, let me just say after the conversation we had on the phone with the company they paid for shipping back and full refund. I had a kitchen. floors and ceilings covered in carrot juice!! I took it to UPS and threw it in a box, they said it was the funniest thing they had every seen in a return as it was still dripping. Since then I did a lot of research and found a Cuisinart blender combo food processor that works much better and is so easy to clean, it juices everything and takes up very little space. I love it as its the size of a blender and easier to use then a juicer. Less mess is good- I would be careful with it and do not let your kids close to it, they can explode due to being made overseas. So awesome! 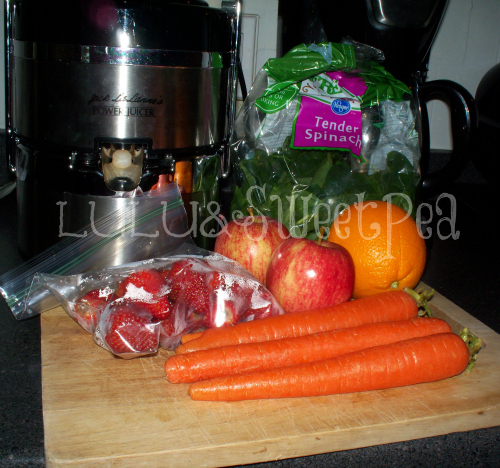 I want a juicer so bad!! We love juicing too! It's awesome what kids will eat when they are introduced to it.